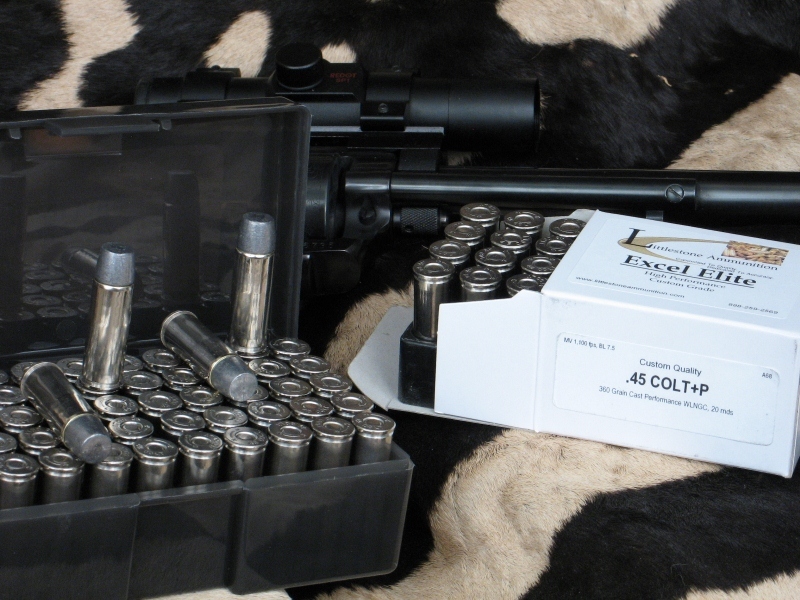 Twenty- and 50-round boxes of Littlestone Ammunition's loading of the .45 Colt +P cartridge with 360-grain Cast Performance Wide Long Nose bullets. Hover cursor or click on photo for close-up view. Firearm not included. That perfectly describes these 20-rounds of Littlestone Ammunition's Excel Elite Custom-Quality loading of the 360-grain Cast Performance Wide Long Nose Gas Checked bullet. It will punch way down deep and do tremendous damage to vital areas. After all, it moves out at 1,150 fps and carries 1,057 ft pounds of energy. The inertia of a 360-grain bullet at that velocity, with a nose that's not excessively wide and doesn't expand, means it's going to go real deep. And with the 18-21 Brinell Hardness of the Cast Performance bullet, it will track straight and crush any bone in its path. Click on the "Add To Cart" button now to purchase this 20 rounds of Littlestone Ammunition.